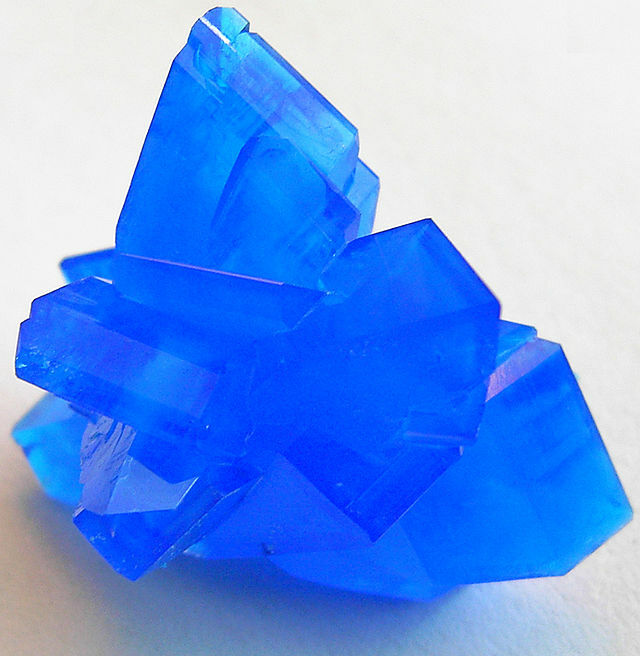 Discovered in the Toscana region of Italy Bonattite is very similar in composition to copper sulfate pentahydrate, except it has only three water molecules in its structure making it a copper sulfate trihydrate. There’s not much information out there on this illusive mineral, but is thought to form in hot spring areas like Steamboat Springs in Colorado. 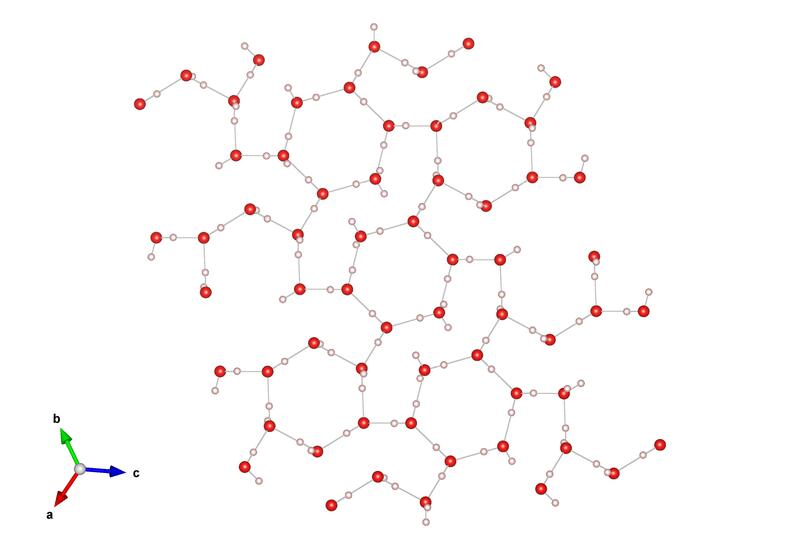 The structure of Bonattite was determined by Zahrobsky and Baur from an synthetic sample in 1968. You can find this structure in the American mineralogical database. By a strange coincidence, all of the water-ice structures we’ve feature so far this year have been disordered. It’s a feature of many of the crystal structures of ice that the water molecules do not sit idle, and in fact flip about the central oxygen atom. So in many forms of ice, from the type found in our freezers and ice caps, to the types found on other planets the hydrogen atoms are never still and are constantly jumping about. But Ice II is an exception to this, and was the first ‘proton ordered’ ice discovered (by proton ordered, we’re referring to the fact that the hydrogen atoms are not jumping about any more!). To create this ice structure requires cold temperatures and a little bit of pressure but this enough to ‘freeze’ the water molecules into position. 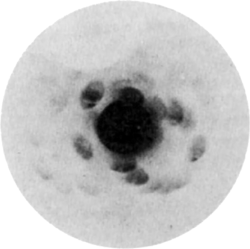 Though Ice II was discovered by Percy Bridgman, its crystal structure was found by Kamb in in 1964 using x-ray and neutron diffraction. The structure of Ice II is #9015045 in the crystallographic open database. Prof Batten tells us about one of the molecules that his group cooked up. Chemists love to give names to things. Sometimes to explain a new concept or phenomenon, sometimes to make a discussion easier, and sometimes to just amuse ourselves and others. So when we discovered the structure shown here, we couldn’t resist. But more on that later. I need to give some background first. The structure is a type of molecule called a catenane. It consists of two ring-shaped molecules that are locked together like rings in a chain. This unusual arrangement of molecules, while fascinating, does not happen by accident. Usually there are weak interactions between the molecules (much weaker than the bonds that define the molecules themselves) that encourage them to associate and form with this particular arrangement. In this case there are flat parts of the molecules called aromatic rings (look for the hexagons in the picture) that like to stack roughly parallel to each other. This is called π-stacking (so-named for the π electron clouds above and below the rings that facilitate this arrangement), and in this catenane there are eight aromatic rings, four from each molecule, that stack through the centre of the structure and stabilise this unusual entanglement of molecules. See also Science, 2009, 325, 518 (DOI:10.1126/science.325_518d). Images generated with OLEX2 software (http://www.olexsys.org/). Nickel is purple, oxygen is red, nitrogen is blue, clorine is light green, carbon is silver and hydrogens are white. Reactions in a crystal? Yes, there are many crystals that when the external environment is changed (heat, light, pressure, gas, electric field, etc) the atoms within a crystal can undergo a transformation. Crystallography can be used to monitor these changes giving three-dimensional pictures of the reaction progress – like a molecular movie!! One particular system is a distorted square planer complex containing a nickel metal centre bound to a ambidentate nitro (NO2) ligand, a bidentate phosphorus ligand called bis(diphenylphosphino)ethane (dppe) and a chlorine atom. The nitro NO2 ligand can bind to the nickell centre through different atoms. Under ambient conditions the nitro binds to the metal centre through the nitrogen atom. When the crystals are exposed to 400 nm light it undergoes a single-crystal to single-crystal transformation in which the nitro ligand changes from a η1-N bound to η1-O bound ligand. At low temperatures the η1-O bound species last for prolonged periods of time (known as a metastable state). At higher temperatures it converts back to the η1-N bound ground state. This procedure can be repeated many times without crystal degradation. 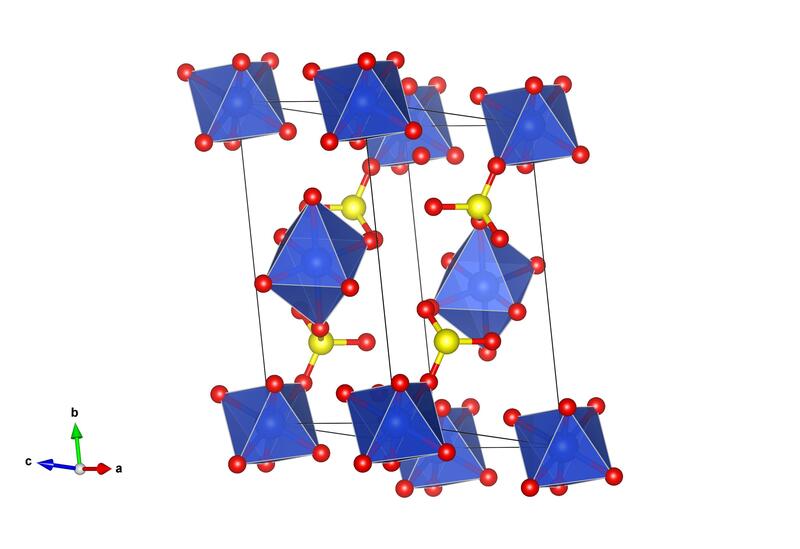 This particular crystal structure was designed by a group from the University of Bath who were particularly interested in following these ‘molecular movies’ within crystals. These types of crystals have applications in digital storage devices, where each orientation can be used in binary code as a ‘switch’ in an on or off position (i.e. N- and O- bound conformations). A feature of supramolecular chemistry is “self-assembly”. Molecules are designed to come together and interact in particular ways to form larger assemblies in a single step. This allows the easy synthesis of complicated structures that would normally be very difficult and time consuming to achieve using traditional synthesis, where multiple steps are required, each step forming a single bond at a time. Imagine putting a pile of Lego bricks in a cement mixer and pulling out a perfectly assembled Lego house when the mixer was finished! A particularly beautiful example of self-assembly is the formation of the “nanoballs” shown above. These result from the reaction of no less than fourteen metal atoms and eight “scorpionate” ligands (so-named because they “attack” and bind a metal with three different arms, much like a scorpion attacks with two claws and a stinging tail). The nanoballs are almost three nanometers in diameter, and pack together in crystals with different arrangements that depend on the solvent they crystallise from and the counterions used to balance the charge on the nanoball. The modular nature of the synthesis also allows variations to be made with different metal ions, though this does not change the packing arrangement. The ability to change the solvent, counterions and metals means that different varieties of the nanoballs can be formed, and different applications can be targeted. With iron they show a property known as spin crossover – changing the temperature leads to the iron atoms changing from a high spin magnetic state to a low spin one. This leads to a change in the magnetic moment, and to the colour of the crystals. If a green laser is shone on it in the low spin state it will flip back to the high spin state; a red laser will then take it back down to low spin, meaning the iron nanoball is in fact a 3 nanometre molecular switch. 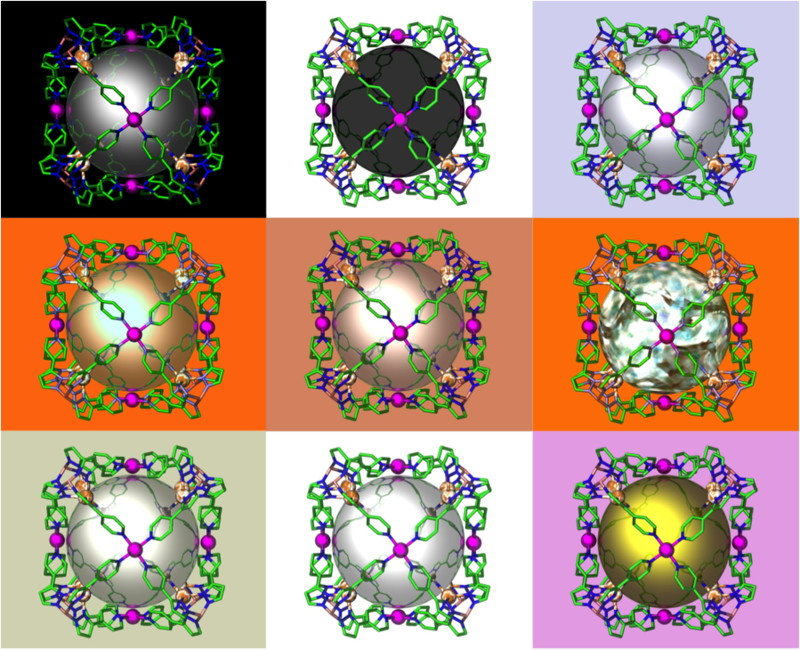 Porous phases are also achieved with perchlorate counterions; they will absorb hydrogen and carbon dioxide, but not methane (indicating a level of selectivity in the gas sorption). The materials will also absorb arrange of solvent vapours, and in the case of iron this also changes the magnetic properties. Ongoing work has also indicated that the copper nanoballs can act as catalysts, making certain reactions go faster and along certain pathways. So these are truly versatile molecules, and the best bit is Nature does most of the hard work of making them. Some may say that this is just lazy; I say it’s simply clever design. Ricin from Ricinus communis with A chain in red and B chain in blue and linking disulphide bond in yellow. Ricin could possibly be one of the most deadly toxins known. It only requires one ricin molecule to kill a cell. It is produced in the seeds of the castor oil plant Ricinus communis, which is very common, particularly in the Mediterranean and tropical areas. The castor oil plant is cultivated for its seeds which is the source of castor oil, and eating anywhere from 4 to 20 of the seeds could prove to be fatal. In its purified form, 1.78 milligrams of ricin is enough to kill an average sized adult through injection or inhalation (ricin is less effective if taken orally). Ricin is a protein known as a lectin, which means it binds to carbohydrates, giving us a clue as to how ricin works. 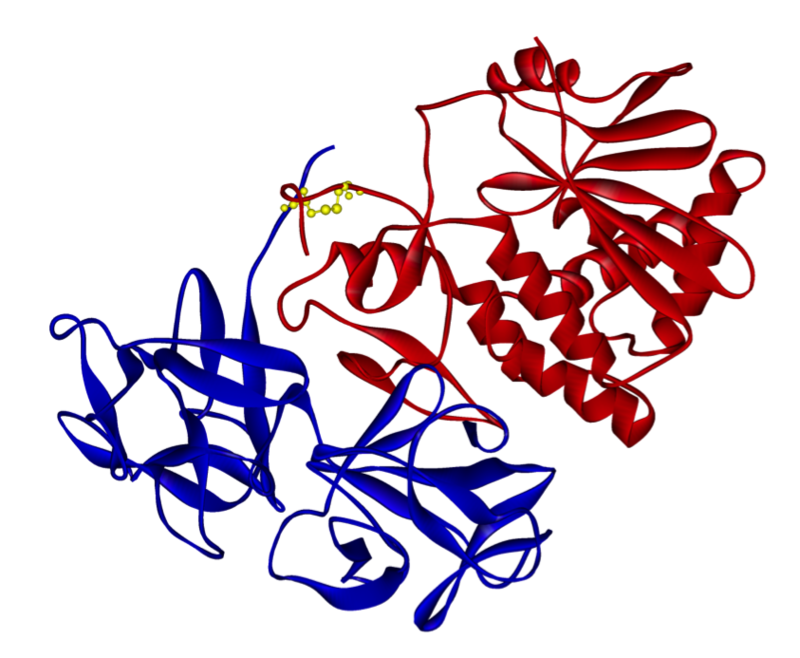 Ricin consists of two protein chains (A and B) linked by a disulphide bond (the part coloured yellow). The B chain (the chain coloured blue in the image) binds to carbohydrates on the surface of the cell membrane allowing the ricin molecule to be internalised into the cell. Once ricin is inside the cytoplasm of the cell the disulphide bond is broken realising the A chain (red). The A chain carries out the deadly functions by breaking down the protein factories inside the cell known as ribosomes (see here for the earlier blog on the ribosome crystal structure) and thus inhibiting protein synthesis. Ricin is notorious due to its potential to be turned into to a biological weapon. But thankfully, ricin, although relatively easy to obtain, is difficult to turn into a weapon due to the difficultly in turning it into an aerosol and difficulty in storing. However, in 1978 during the cold war Bulgarian writer Georgi Markov was killed in London by a ricin filled pellet fired from the tip of an umbrella. On a more cheerful note ricin also has many potential therapeutic applications. Ricin has been used to create immunotoxins. This is where the ricin molecule has been linked to an antibody so that the potent activity of ricin can be delivered to specifically kill cancer cells. The structure of ricin was solved by Earl Rutenber and colleagues in 1991  and has the PDB number 2AAI in the Protein Data Bank. E. Rutenber, B.J. Katzin, S. Ernst, E.J. Collins, D. Mlsna, M.P. Ready, J.D. 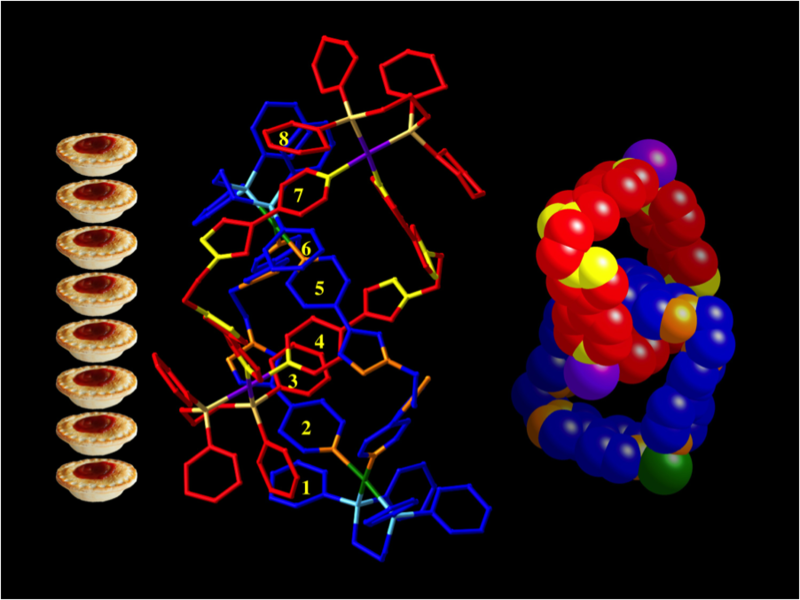 Robertus (1991) Crystallographic Refinement of Ricin to 2.5 Å. Proteins 10: 240 – 250 .